Potatoes (aloo in Hindi) are a popular filling food item in India. 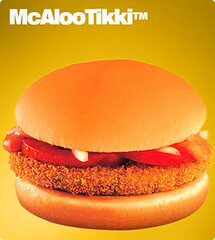 McDonald's in India's McAloo Tikki ™ sandwich includes a patty made out of potatoes, peas, and spices. It also includes tomato slices, onions, and vegetarian mayonnaise. Paneer is referred to as cottage cheese in India, but it is nothing like what we call cottage cheese here in the U.S. It is made from milk but is similar in texture to tofu. McDonald's in India's Paneer Salsa Wrap ™ starts with a small slab of paneer that has been dredged in a coating that is a cross between Mexican and Cajun in flavor. I'm not sure if it is then fried or baked, but the coating is crunchy. The paneer patty is wrapped in flatbread and topped with a salad mixture that includes lettuce, red cabbage and celery and then is finished off with vegetarian mayonnaise, salsa and cheddar cheese. McDonald's in India's Crispy Chinese sandwich is somewhat misnamed. It is crispy, but I'm not sure it resembles anything that I've ever eaten in a Chinese restaurant either in the U.S. Nevertheless, this vegetarian patty which is topped with a creamy Schezwan sauce and lettuce is a nice addition to McDonald's in India's vegetarian menu. If you are in the mood for something similar to pizza, but don't want a tomato-based sauce, McDonalds in India's Veg McCurry Pan ™ is a good choice. It starts with a rectangular shaped crust that is topped with a creamy sauce (made without eggs), and vegetables including broccoli, baby corn, mushrooms and red bell pepper. It is then baked until the crust is crisp and the toppings are hot and bubbly. 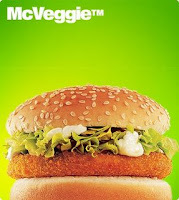 The McDonald's in India's vegetarian Pizza McPuff ™ is another favorite of mine. It also starts with a rectangular shaped crust, but instead of a creamy sauce is flavored with a tomato-based sauce and then is topped with carrots, beans, bell peppers, onions, peas and mozzarella cheese. Thanks for sharing these food choices at Indian McDonalds! Some of them actually sound quite good. There are a lot of vegetarians here in California; I wonder if McD's has considered bringing some of those items here? I always find it fun to visit a McDonald's in other places, as they usually have regional food choices (like a plate lunch of teriyaki chicken, rice, and potato salad in Hawaii). Hello the MacDonald menu is not totally bad they also offer good healthy food like the salads and the light menus but for the most of the people this is invisible , they like the cheeseburgers they like the sodas and so many other non healthy products . also they offer food that help the system but i strongly think that the only product that really help against the Ed is in the drugstore go there and Buy viagra, is really will help improve you're health .